I Need 150 mg of Trimethylxanthine IV Push Stat! Recently I visited New York offices of a certain Redmond based corporation. The corporation in question always has free snacks and soft drinks in its numerous kitchens (the home campus having an especially fancy selection at that). Their office coffee machine fascinated me even more than “Colombian Supremo” vs “Colombien La Vereda” K-Cups and content of “Milds” in Mother-Parkers’ packets. (As a side note I’d like to add this rumor that Tim Horton’s coffee made by Mother Parkers is so addictive that some people think it contains cocaine). 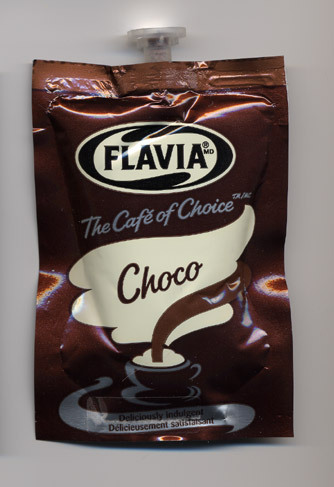 I asked to keep one as a souvenir – they were out of coffee and this is actually a hot chocolate packet. The coffee packets were probably all injected by employees. They also had tea packets which were smaller in size. Next PostNext Does Your Digital Camera Have Enough Bling?